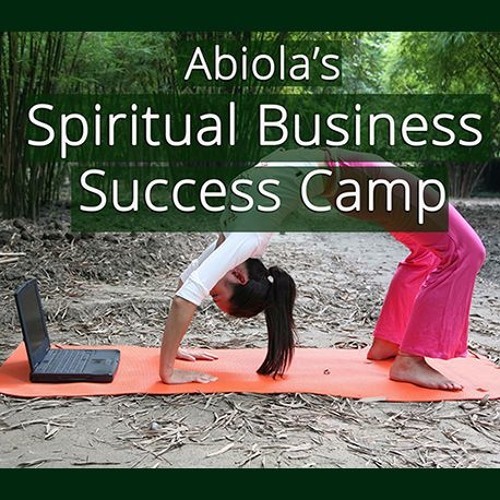 Spiritual Business Success Camp! Day 6 of Spiritpreneur Content Marke12 Days of Blissness ting with Abiola Abrams. Join me free: http://UnblockMyBusiness.com Join me in Bali: http://UnblockMyBusiness.com Hey My Goddess, YAY --SO excited that you are here. Are you a Spiritpreneur? A Coach, Healer, Empowerment or Creative Guru who wants to build a prosperous business online with a rockstar message and platform? As Spiritpreneurs, we must be focused on inner game AND outer game. In other words, it's about soulcare plus skills and strategy. If you participated in my free 14-Day Unblock My Energy Shift, that was all inner game. Manifestation also requires outer game -- taking INSPIRED ACTION. My monthly Manifest Your Magic Moon Circles are all mindset and manifesting - self-creation. The Spiritual Business Success Camp is all radical action. You DOUBLING your Spiritpreneur Business means doubling your message, your INCOME and reach AND us doubling the light, magic and positivity in the world. As spiritual business people we are naturally dreamers. We live in our heart chakras. Building a business and manifesting your BIG BOLD BRAVE dreams requires us taking radical action. That's what this mini course is about and that is what my upcoming 2017 spiritual business coaching group, The Spiritpreneur Warrior Business Sisterhood is about. To be clear, I love you, but you are a mess! WE ALL ARE -- that's part of the condition of being alive. I'm not talking about our personal dramas - although that's part of it. I'm talking about the fact that your business has cracks in it. How do I know that? You've been telling me. In 2017 I am launching the Badass Spiritpreneur Business Sisterhood, a monthly coaching group for you to get your courses, sales, funnels and business bright and shiny. You should be reaching more people with your message AND making more money - let's fix that.